We are Mary & Mike Mignogna and we live in Northeast Ohio with our two male Akitas, Rocky (who is 10) & Apollo (who is 5), and our two female Akitas, Mikki (who is 9) & Polli (who is 3). 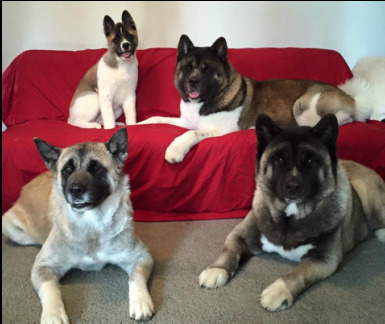 We have been involved with the Akita breed since 2002 and value the information we have obtained since then and that we learn on a daily basis. Mikki produced our first litter on April 1, 2013 with 3 boys. The boys are in their forever homes. You can view this litter on our Breedings Page. Mikki's second litter (3 boys and 2 girls) was born August 21, 2015 and was sired by Apollo. These puppies are also in their forever homes. We kept one from this litter and her name is Polli. Polli has recently graced us with the births of 8 puppies (3 boys and 5 girls). Please see our Breeding page for more information. I train and show our dogs in Conformation, Rally, and Obedience through the American Kennel Club, the United Kennel Club, the Canadian Kennel Club, and also the International All Breed Canine Association. I am serving my tenth year as a Board Member & my fifth year as the Corresponding Secretary / Membership for Youngstown All Breed Training Club (YABTC) & am a current member of the Akita Club of America (ACA) and the Ohio Stewards Club. I am serving my second year as Director at Large for Region 3, Versatility Committee Liaison, & Performance Committee Liaison through the ACA and am the Obedience Chair for YABTC Obedience Trials. I teach Rally, Puppy, and Beginner obedience classes & run the Rally Run-Thrus at YABTC. I am also a Rally Judge and a Canine Good Citizen (CGC) / Trick Dog Evaluator through the AKC. Thank you for visiting our website. We hope you enjoy viewing our dogs and feel free to contact us if you have any questions about the beautiful breed we have fallen in love with ... the Akita. written permission from MiMar Akitas.